Johnson's Ocean Currents and the Great River Basins of the World, by Prof A. Guyot. 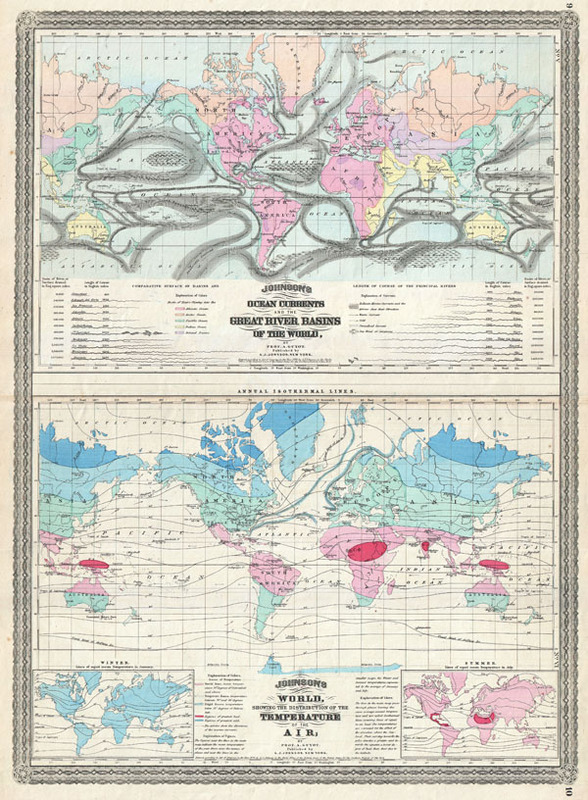 / Johnson's World showing the Distribution of the Temperature of the Air; by Prof A. Guyot. Arnold Henry Guyot (September 28, 1807 - February 8, 1884) was an important Swiss-American geologist and geographer working in the middle part of the 19th century. Guyot studied geography at the college of Neuchatel in Berlin, Germany before moving to Cambridge, Massachusetts in 1848. There he worked with the board of education for several years before being tenured as a professor of Geography at Princeton in 1854. He remained at Princeton for thirty years until his death in 1884. He is known for his extensive meteorological studies and for his discoveries regarding the motion and structure of glaciers.